Mens kilts have been around for hundreds of years. They have been worn in the Highlands of Scotland since at least the end of the 16th century. Their popularity is growing around the world, as more and more of you resonate with your Celtic heritage. Nowadays even men with no ties at all to a Celtic heritage find themselves wearing kilts, simply because they find them both manly and comfortable. Mens kilts are unique, in as much as you can wear them to any occasion you may wish to attend. What other item of clothing can you say that about?. Not only can you wear them to almost any occasion, but they are so versatile that they can be worn as a uniform at work. And just to show you what I mean, below you can see a photo of two police officers, serving with the Lincon police department in New Hampshire. 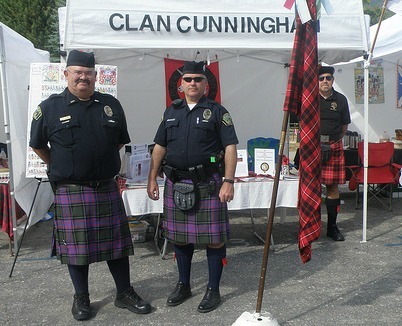 They were photographed visiting the Cunningham Clan's booth, at the New Hampshire Highland Games. So what is it about mens kilts that make them so popular? Well one reason is of course the fact that the kilt is the National Dress of Scotland, and as such is worn with great pride by hundreds of thousands of clansmen around the world. But you don't have to belong to a clan in order to wear a kilt, in fact many people with little or no connections to a Celtic past, enjoy the freedom that only kilt wearing can deliver. If you have never worn a kilt, but find yourself drawn to its elegance and sense of style, then I urge you to take your courage in both hands, and perhaps rent one for a weekend. Many men would love to wear a kilt, but lack the confidence to go out in public wearing one. But take heart from the next photo. 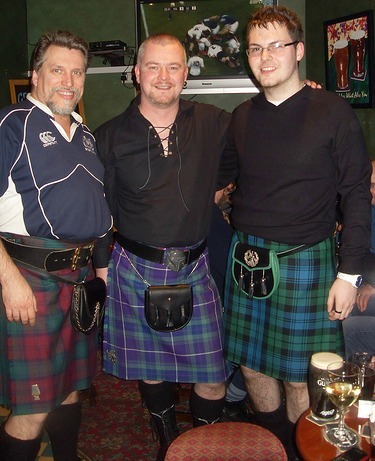 Here you see three Scotsmen with lots of self confidence, enjoying a visit to the pub, and their night out is all the more special because they are wearing their kilts. Take it from someone who wears his kilt at every possible opportunity, wearing a kilt will get you noticed. In fact I can't think of any other outfit that can inspire a complete stranger to strike up a conversation, the way a kilt outfit does. It doesn't matter where you go wearing a kilt, other people find them fascinating, so much so that they are willing to break the ice to ask about your kilt. Some of the more common questions include,"which tartan is that" or "how much material is in your kilt", and perhaps the most commonly asked question of all "what do you wear under your kilt". Not surprisingly many more women than men ask these questions, the truth is that most women find men in kilts very attractive. Possibly one other reason why so many men love to wear them. Even the youth of today are realizing how comfortable, practical and fashionable kilts are. Below you can see three young men, snapped on Edinburgh's Royal Mile. The two in the foreground somewhat posing for the camera, while the young man in the background seems unaware, although the young lady has certainly seen it. They are by far, much more comfortable than trousers (pants) and are much healthier (air circulates to all the important places). If you have ever strolled around the house wrapped in your bath towel after your shower, you will have a sense of how comfortable and liberating a kilt is. Kilts are also finding their way into the world of entertainment. 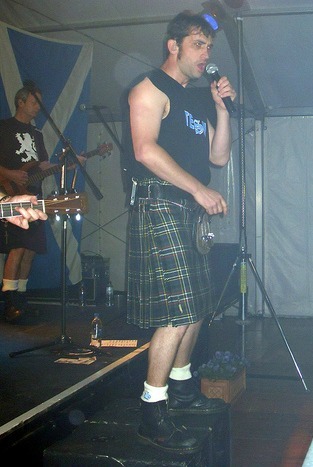 The following photo shows Ian Scott, better known as Scottie performing live on stage wearing the kilt, notice Phil Clayton the guitarist in the background, is also kilted. Mens kilts have one other redeeming feature which is unique, and that is, that they last a lifetime. They are handmade, from the finest worsted wool, and as such they are a quality garment, which when properly cared for will ensure a lifetime of wear and beyond. So if you are considering buying an outfit for the next wedding you attend, or perhaps the next formal dinner, or indeed any other occasion, you may want to consider buying yourself a kilt outfit. You will then be the proud owner of an outfit that you can wear to any occasion. If you would like any further information concerning this page, or any other on the website, or there is something particular that you don't find covered, then please drop me a line using the contact us page, and I will be delighted to help.